Arctic sea ice extent presently stands at it second-lowest level on record and could set a new low in coming weeks, reports the National Snow and Ice Data Center (NSIDC). With several weeks left in the melt season, sea ice extent fell to 5.26 million square kilometers (2.03 million square miles), just below the 2005 minimum, which had been the second-lowest extent in the satellite record. NSIDC data shows that Arctic sea ice extent has declined 2.06 million square kilometers (795,000 square miles) since the beginning of the month and that the extent in now 1.97 million square kilometers (760,000 square miles) below the 1979 to 2000 average. 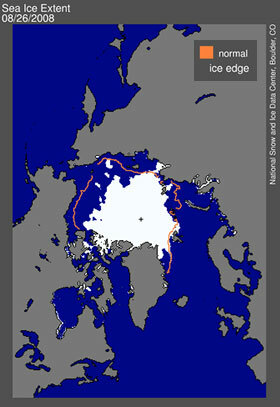 Daily Arctic sea ice extent for August 26, 2008 Courtesy of the National Snow and Ice Data Center. The lowest recorded minimum of 1.59 million square miles occurred in 2007. Sea ice extent was so low that the Northwest Passage opened for the first time on record. Scientists say the Northeast Passage — north of Russia — may soon also be navigable due to disappearing sea ice. The melting set off a scramble between Canada, Russia, the U.S., Denmark, Sweden and Norway which are all seeking to claim rights to the Arctic’s rich mineral, oil and gas deposits. The Arctic is particularly sensitive to changes in the extent of sea ice, which helps reflect sunlight back into space, cooling the region. When sea ice melts, the dark areas of open water absorb the sun’s radiation, trigger a positive feedback loop that worsens melting. When there is less cloud cover, the effect is intensified.